I have partnered with The Laughing Cow to create this post. I have been compensated for my time commitment to work with their product, however my opinions are entirely my own and I have not been paid to publish positive comments. 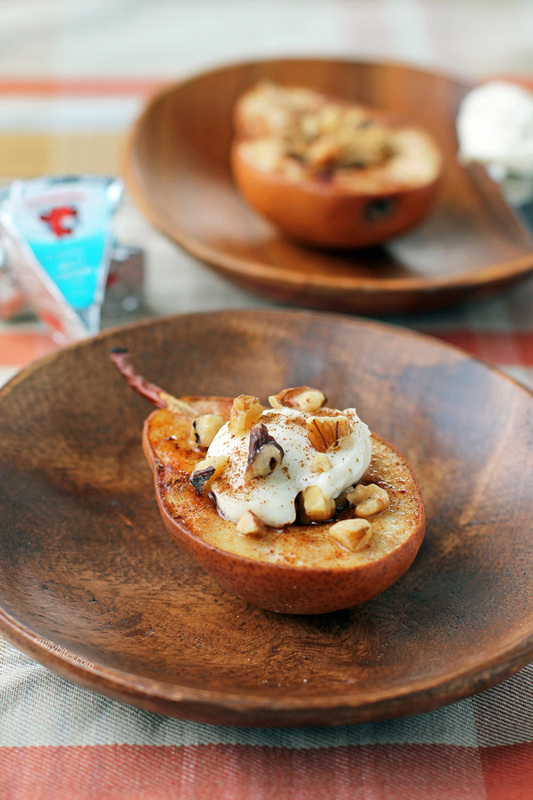 I am so excited to share these Cheesy Cinnamon Baked Pears with you all today – you’re going to love them! They’re incredibly easy to make (seriously, the prep time is just a few minutes) and they’re oh so delicious. 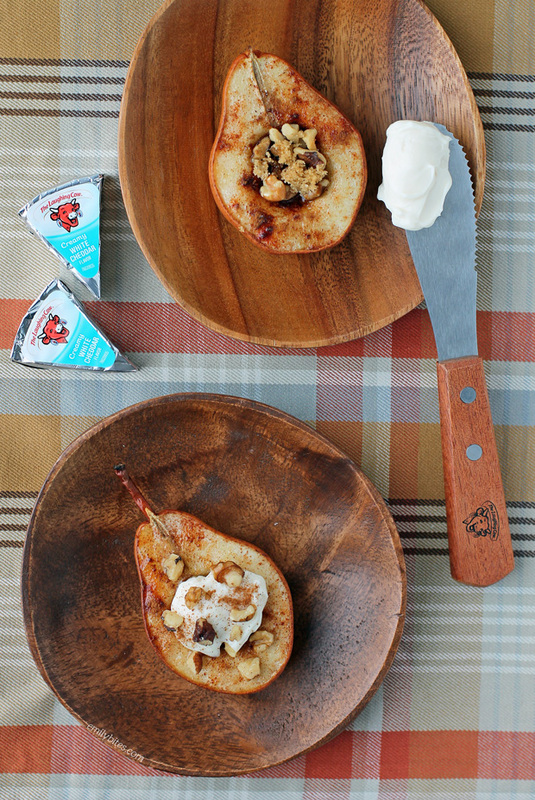 Warm, lightly sweet baked pears sprinkled with cinnamon and brown sugar, spread with The Laughing Cow’s Creamy White Cheddar cheese and topped with crunchy walnuts…I’m swooning just talking about it. These baked pears would make a beautiful dessert for a dinner party, but they’re also perfect for a snack or even as breakfast! I had the recipe make two servings (using one pear) but it could easily doubled or tripled to feed a crowd. As if all that isn’t reason enough to make these, each serving of these Cheesy Cinnamon Baked Pears with all the toppings is only 99 calories or 2 Weight Watchers SmartPoints! I’ve been working with The Laughing Cow for over a year now (and eating their cheeses for many, many years prior) and I never run out of new and tasty ways to use their product. The flavor combination possibilities are endless and what snack is there that can’t be improved by adding cheese? I love pairing their Spicy Pepper Jack cheese wedges with something sweet or jazzing up veggies with their Creamy Swiss Garlic & Herb flavor. I shared another fun idea using their cheese wedges on the blog back in November with my Cheesy Apple Walnut Bruschetta, and if you’re looking for more ways to snack curiously just visit The Laughing Cow Facebook page and head to their photos. In addition to their own creative snack ideas, you’ll see a ton of my own creations they’ve shared including Peach Salsa and Queso Fresco Crostini, Caprese Bites, Maple Bacon Pepper Jack Toasts and many more! I’ll be continuing to develop cheesy snack pairings for The Laughing Cow social media accounts all year, so make sure to like their page and stay tuned! 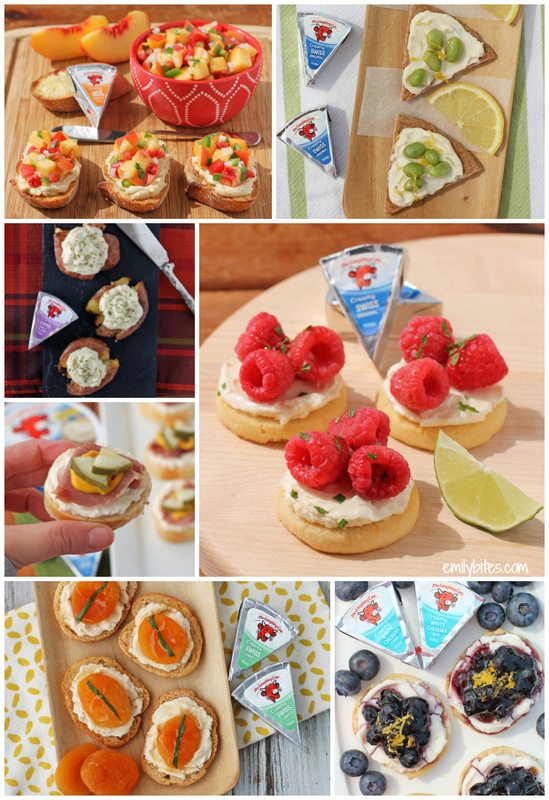 A few of the snacks I created for The Laughing Cow Facebook page – follow them for these and more! Pre-heat the oven to 350. Set out a glass baking dish. Cut your pear in half from stem to base. Use a spoon to scoop out the seed/core area, forming a round hollow valley. Sprinkle ½ a teaspoon of the brown sugar over top the two pears and follow with a sprinkling of cinnamon. Use half a tablespoon of the chopped walnuts to fill the valleys of the pears. Sprinkle the remaining ½ teaspoon of brown sugar over top of the walnuts. Place the pears cut side up into the baking dish and place in the oven. Bake for 30 minutes. While the pears are baking, place the cheese wedge on a cutting mat or piece of parchment paper and use a spreader knife to “whip” or smush the cheese until it’s smooth and no longer shaped like a wedge. Split the cheese into two equal piles and use your spreader knife to smooth them into thick rounds. When the pears are done baking, remove them from the oven and transfer each to a plate for serving (careful, these will be hot!). Use your spreading knife to slide underneath and carefully lift the round cheese forms off the paper or mat and place them on top of the baked pears. Sprinkle the remaining half tablespoon of chopped walnuts over the tops and finish with another pinch of cinnamon if desired.